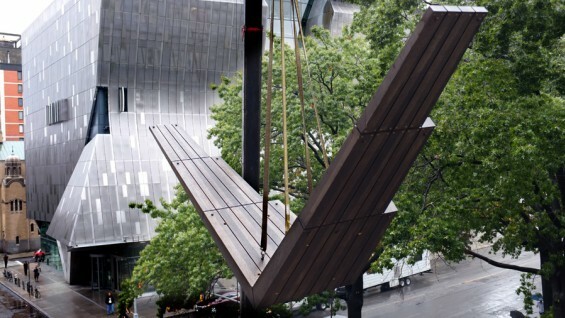 Like a giant bird that has alighted on its way South, The Glider by Massimo Scolari, has landed on the Foundation Building. See the process it took to get there by scrolling through the pictures above. 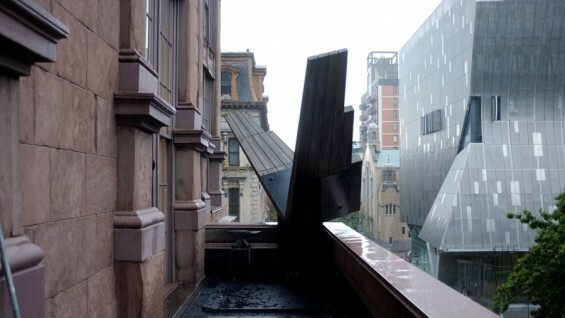 Indicative of a recurring motif in Scolari’s work, the wing-like sculpture arrives to celebrate the Italian architect, artist and designer’s return to Cooper Union in a new retrospective of the maestro's work, Massimo Scolari: The Representation of Architecture, 1967-2012. After an opening reception on Tuesday October 2nd, the exhibit opens to the public from October 3 through November 21st. Scolari was previously faculty of the Irwin S. Chanin School of Architecture in 1977-78 and was concurrently the subject of a retrospective at the school. 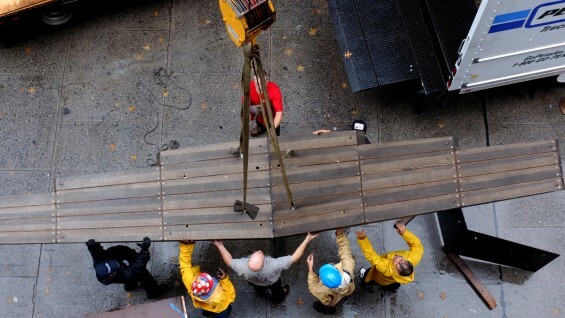 Installed during a rainstorm, getting the The Glider, a four-hundred pound wooden and metal sculpture with a 22-foot wingspan, onto the third floor balcony of the historic building required a great deal of planning. Architecture faculty Markus Schulte provided the structural specifications to ensure the installation could sustain potential wind gusts and remain secure throughout its exhibition. Jeff Carter, the original fabricator of the sculpture, then built the 1,600-pound metal base on which the sculpture now rests. Lifted by a crane aquired with the help of the F. J. Sciame Construction Co. the base had to be bolted to the balcony and then the wings were floated up and carefully secured to the base. The full process appears in a timeline of photos at the show.